My recent painting series is inspired by a boat journey to Bornholm, a Danish Island in the Baltic Sea. Arriving there, I had such an affinity for this place, it was as though I had arrived inside one of my own paintings. I was struck by the pure light, medieval round churches, open fields, ancient castles and the deep blue of the sea. This work is a combination of the rich topography merging with my imagination. When painting, I am inventing another world that has no morning or midnight, no beginning or end; instead, I try to capture a suspended moment in time. Ideally, the images act with the unexpected quality of syncopated rhythm, accenting a beat normally unaccented. 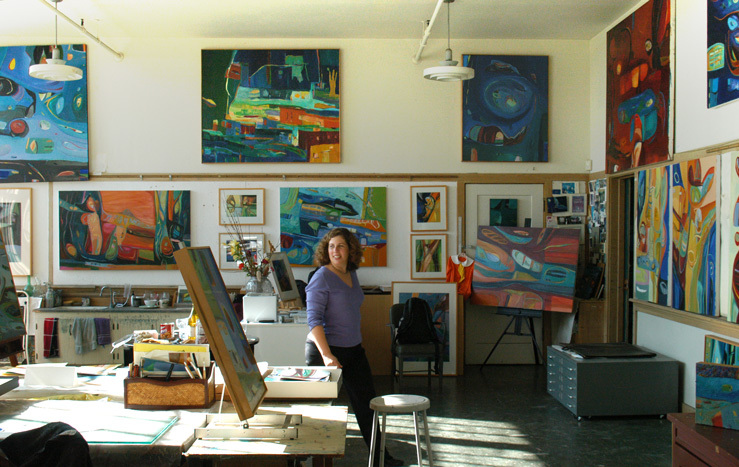 My paintings are explorations into fields of color, lyrical forms and the ambiguity of spatial relationships. My paintings contain numerous layers of images; often an image will be buried within the work, only hinting at its form’s full existence. It is these layers and traces of creation that intrigue me, for they are a way of covering and uncovering, a way of seeing and then seeing again. My artistic process is stimulated by that moment when rediscovering experiences can trigger the unexpected. It is this heightened anticipation that continually fuels my passion for painting. Ultimately, I strive to create an atmosphere in my work filled with mystery and vestiges of memory that engage the present.